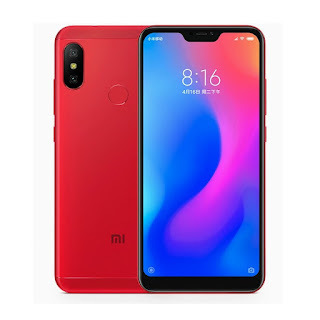 Hey friends, today in this post i will explain about the newly launched Xiaomi Redmi 6 Pro. What are the features, specifications you will know in this post. It was launched in China on Sunday. It's having a 19:9 notch display with 4000mAh battery, an octa-core Snapdragon 625 SoC, a microSD card slot, dual rear cameras & voice assistant features. It runs on Android based MIUI 9, with Adreno 506 GPU, 3GB or 4GB of RAM, 5.84 inch full HD+ display with a 84 percent NTSC colour gamut. It has an octa-core Snapdragon 625 SoC clocked up to 2 GHz. The camera feature of this phone is dual rear camera setup, with a 12-MP primary sensor featuring 1.25 micron pixels, an f/2.2 aperture, LED flash, apart from the 5 MP secondary sensor & PDAF. It has 5 MP front camera, with AI Portrait mode & HDR. Here in this phone there are 32GB & 64GB inbuilt storage which is expandable upto 256GB (via microSD). It has 4G VoLTE, Wi-Fi 802.11 (dual band 2,4GHz, 5GHz), Bluetooth v4.2, Micro USB, 3.5mm headphone jack. It has a fingerprint sensor on the rear panel.It measures 149.33 X 71.68 X 8.75mm, and 178 grams.It has also a proximity sensor,ambient light sensor, gyroscope, infrared & digital compass. It will be available in Black, Gold, Pink, and Red colour variants. Its price starts at CNY 999 (around Rs. 10,400) for the 3GB RAM, 32GB storage, CNY 1,199 (around Rs. 12,500) for the 4GB RAM, 32GB storage and CNY 1,299 (around Rs. 13,600) for the 4GB RAM, 64GB storage variant. ROM- 32GB/64GB inbuilt & expandable up to 256GB via microSD.